The SW Communication Cable Loops are Strong, Flexible, Inexpensive, Stackable, Re-Useable, Plenum Rated Nylon Hangers Designed to Delicately Cradle Sensitive Communication Cables. 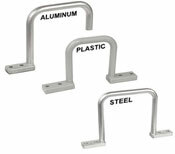 Aluminum Distribution Rings are used when support for multiple vertical or horizontal cable runs is required on walls or ceilings. They have an inside diameter of 2, 3, 5”. Service Warehouse distribution rings have a smooth surface that prevents cables from being damaged. Wire Distribution Spools are used to neatly organize internal pairs or wires as they are being terminated on communication backboards and racks that are wood, steel or concrete. The Service Warehouse wire distribution spools provide a quick and easy means to support wires on wood or metal surfaces. J-Hooks These J-Hooks are for routing sensitive data communication cables. J-Hooks are also a cost effective alternative to expensive cable tray. They are made of Yellow Zinc Chromate Finish and comply with UL, cUL, NEC, and EIA/TIA requirements for structured cabling systems. The ONLY communication cable support made specifically for ceiling wire applications. Com Dangles are an extremely cost effective alternative to cable trays and J-Hooks. Typically 1/2 to 1/3 the cost of a traditional J-Hook Installation. In addition, ComDangles Cable Management are made from an advanced polymer and are UL Listed, Plenum rated, and RoHS compliant.